On Wednesday, August 23rd, my friend and brother in Christ, Pastor Duke Ajieh, was promoted to Glory. He had been ill since December 2016. He leaves behind his dear wife Florence and 4 beloved children, Erica, Rex, Ifejuwa and Chukuka. Ujene Duke Ajieh was born in Nigeria in 1956, and came to Norway with Florence in the late 1990´s. 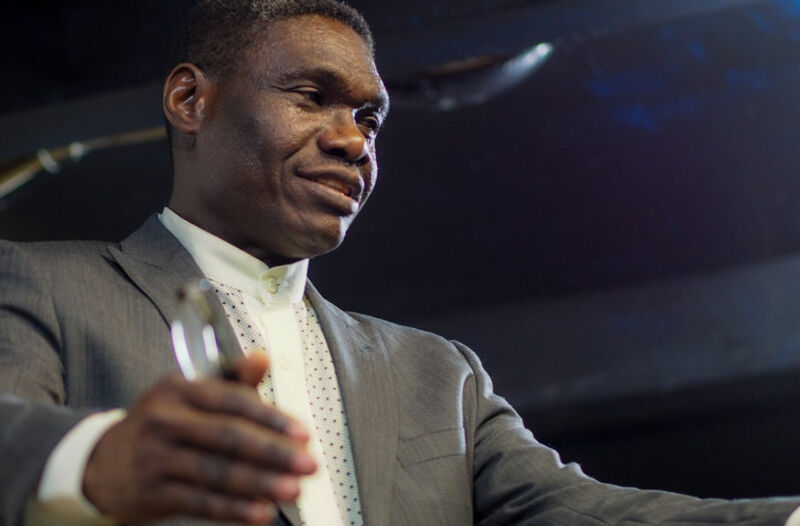 In 2001 the first steps were taken to establish an Oslo branch of the world´s largest Pentecostal movement, Redeemed Christian Church of God (RCCG), founded in Nigeria. 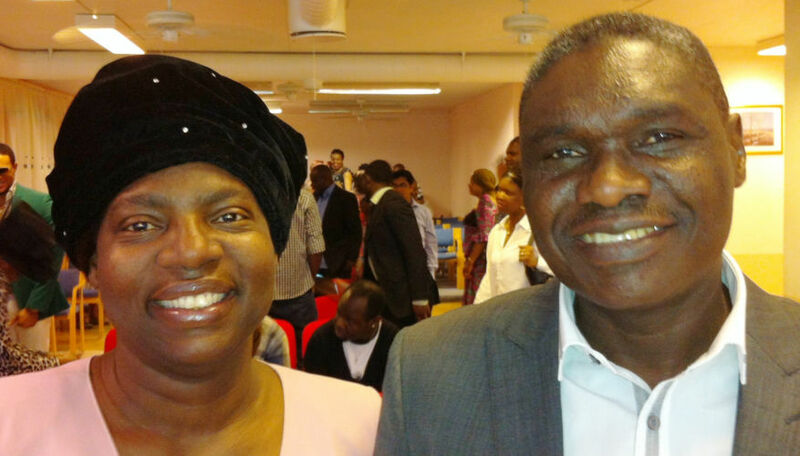 Under Duke Ajieh´s leadership, RCCG Norway grew to seven local branches, which were supervised by Pastor Duke from his base at RCCG in Holmlia, Oslo. Duke Ajieh also served as a board member of the expansive RCCG Europe. 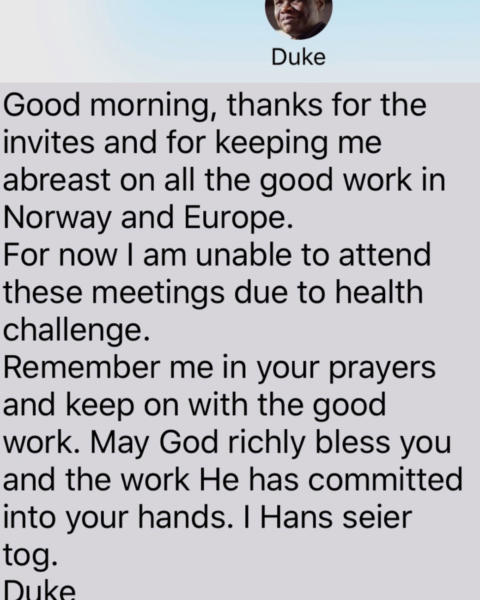 The last message Jan-Aage received from Duke, a few days before he died. I got to know Duke in 2001, and we often ministered in each other´s churches. In 2005, the Lord instructed me to wash his feet as a prophetic declaration of his leadership to the Body of Christ in Norway. As the Director of European Apostolic Leaders (EAL) since 2013, I have served with Duke Ajieh´s pastor colleagues in Poland, Germany, Romania, Bulgaria, Greece, Italy, Spain, France, Belgium, Netherlands, United Kingdom, Denmark, Sweden and Norway. Everywhere, Duke Ajieh was held in the highest regard as a true man of God and a faithful colleague. Duke Ajieh was my friend. I called him Duke, and he is the only African minister I know who called me by my first name as well. We were simply friends. When my life crumbled in 2007, Duke was there for me. He stood up for me when most people left. When Aina & I married in 2010, Duke acknowledged and supported us. When we started rebuilding our ministry in 2012, Duke was super-supportive. He preached for us, and invited us to RCCG. Aina & I loved Duke. Now, we rejoice that Duke is HOME. See you "next time", Bro!